but how exhausting, just so you know. and just how, they ask, will we stay? God will direct hearts, we shall soon see. 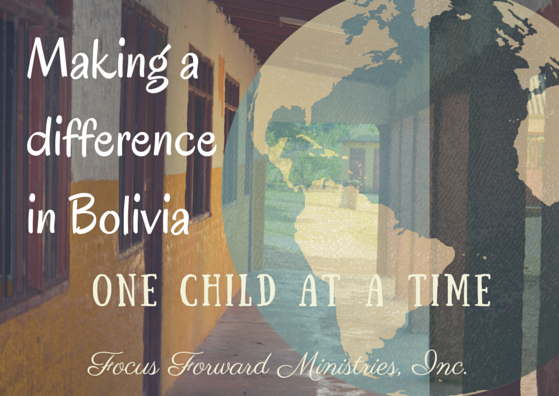 The task ahead has loomed –mostly after the initial day of “excitement” that came with the news of our approval as missionaries to Bolivia! Can I just share my heart a minute? I haven’t done that in a while–and pardon the tears–for they just seem to happen when I mentally see those little faces-it’s hard to explain. If you could experience the anguish of the wait–the internal examination of your life since you first became aware that you were “you”…like we have the past 11 months or so, since we first said “yes” to a God who sees all and knows every detail…. “who do you think you are? Are you kidding? At your age? What ability do you think you have? Seriously?” Over and over and over. Of course, then came the paperwork. We won’t even go there–because there is possibly a “soon-to-be” called missionary reading this and I certainly don’t want to scare you away–trust me–if God has called you–there is NO other life choice for you. Paperwork-schmaperwork. Just do it. If you could know the feelings that I get preparing for each trip- when the donations begin coming in for school supplies for those kids who will never have a chance at a brand new box of crayons without your help. Or those little girls who we took dresses to this year–they would have never had the opportunity to have their very own “first time” brand new dress–without your help (East Side Baptist Church-Vernon, FL)–and it honestly leaves me speechless. And to see the look in the mama’s eyes putting it on her little girl…oh friend, if you could know. You were here…but those dresses worked “there”. If you could know what it feels like to hug the body of a little girl who has never ran or played like other girls, who gets made fun of because she had an old walker that had been sawed-off to suit her short build, but was still too wide. If you could see the tears fall hot and fast from her older sisters eyes when we walk in their yard with a brand new child-sized walker with wheels and a seat, and they realized someone saw a need and had compassion. They may not know the word–but they know the feeling. And some friends from “here” went “there” by helping buy that walker. If you could walk into the tiniest one-room-home of a little 13 year old girl and see her little baby–and her own baby doll still in the same one room dwelling and know that her life will never return to playing with dolls because now she has one of her own…and she has to be responsible…. If you could board that airplane coming back home and feel that tug in your heart that you are not finished with what you are supposed to do….if you could dream the dreams that I have had for the past 3 years and see the haunting and desperate faces of those who have not been introduced to Christ yet, and wake with a sweat and urgency that the job must be done quickly–for we are running out of time–and you would feel that to stand before a congregation is a fearsome thing to do because your greatest fear is that just may not “get-it” like it has grabbed your soul for the past 4 years of your life. If you click on this link, it will take you to our page with AGWM. From there you can choose to journey and partner with us. You will not be required to leave your home, but you can invest in our journey and join us for the ride of a lifetime. 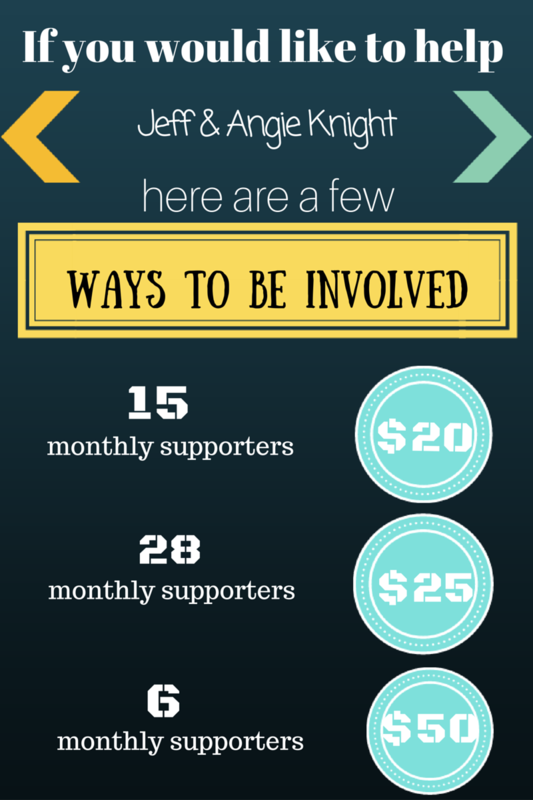 I have created this little guide below, but really, you can choose whatever dollar amount will fit your budget. Once we get to the field, we will be there for two years. We hope that everyone who starts out this journey, will finish it well with us! You can even just give a one time donation–which it is all tax deductible and you will be mailed a receipt each time you contribute. I remember the first 4 missionaries we began supporting. One of them I had never met. But I strongly felt God lead me to begin supporting them. We added more to our list over the course of the next couple of years and still support them all today. We can’t go to the countries they are in, some are in very sensitive countries, but by giving each month–we are joining them by helping them stay on the field. Jeff and I have quite a way to go to get there–and we are hoping to get there soon. Would you like to join us? There is also a place to sign up to become prayer partners on our page and we hope that everyone will do that. We really need prayer support. I learned that in such a major way while we were there in October. And please pray as we are calling and emailing pastors–we need open doors, ten minute windows, 5 minute windows–whatever is available we will gratefully accept. God will do the rest. May God bless you for your sacrifice and love toward us and what He is doing in our lives. © 2016 Angie Knight- The Knightly News. All rights reserved. This entry was posted on Wednesday, January 6th, 2016 at 12:29 am	and posted in Ministry, Missions. You can follow any responses to this entry through the RSS 2.0 feed.